Day 2 dawned bright and late for your jet-lagged Ramblers. After a very full Day 1.5, the crew did not manage to crawl out of bed until 10am. 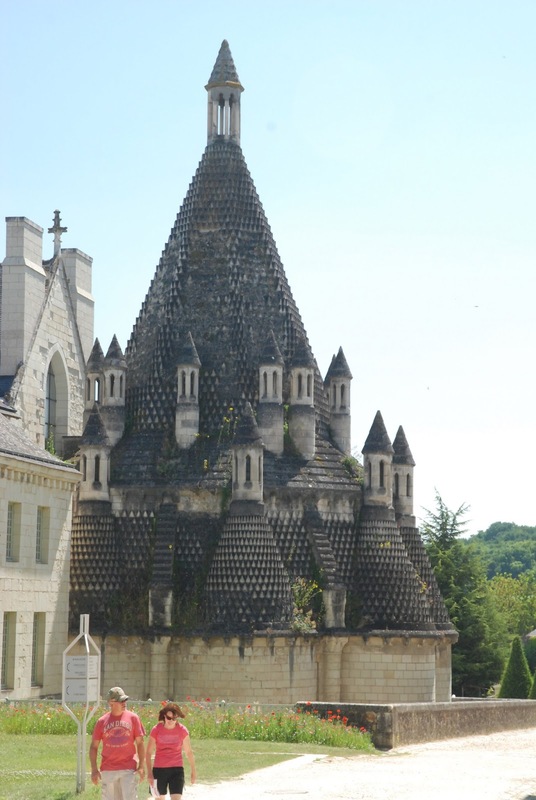 After puttering around, eating our local croissants and generally moving slowly, we hit the road around noon and asked Gabrielle to take us to Abbaye Royale de Fontevraud. The Abbaye was about an hour away by car, so we set out to drive across more French countryside to reach it. 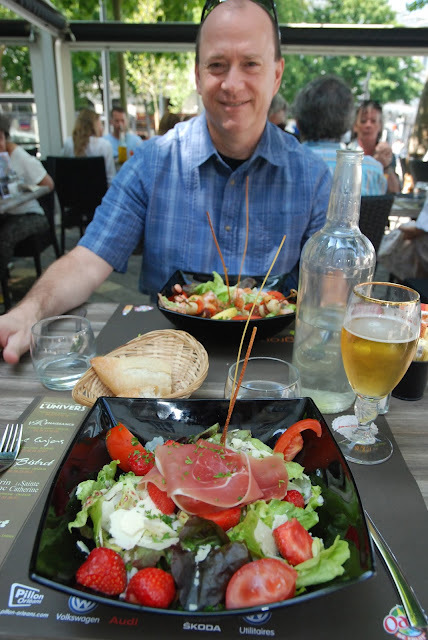 Given our late start, we detoured into Tours Centre (the center of Tours, and to Gabrielle's dismay) and had a little lunch at a local brasserie. Tours is a lovely small city of about one hundred thousand people. Here is the beautiful fountain in the center of town. And of course, what would a meal be without pictures? The French can make even a simple salad look like a work of art. Yes, even a simple salad is beautifully prepared. Your Ramblers also got their first lesson in tipping en franchise. After lunch, we pulled out and Gabrielle got us back on the path to the abbey. The amount of traffic on a French interstate on a holiday weekend was a sight to behold because....well....it wasn't there. I guess gas prices north of $6 a gallon, lots of tolls and a great passenger rail system have their impacts. Charlie Munger would be proud of the incentive system at work. The drive home was uneventful. Upon inquiry to the friendly hotel staff, we got dinner reservations at a local (Rochecorbon) restaurant. We ambled down the road and proceeded to walk into an empty restaurant. But not to fear, because French dining 101 says "no one is in a restaurant, and then all of a sudden it is full". Many restaurants are only open certain hours (11:30 -2:00 for lunch for example) and most customers show up at similar times. Once again, a we had a beautiful meal but a long meal. (Rambler Darryl would be straining at the bit.) To interrupt patrons while they talk late in a meal with a bill or other questions is considered rude by the waiter as it interrupts the conversation; of course, by the end of our meal, we were playing games on our cell phones waiting for the bill to come. Your American Ramblers are still getting acquainted with the idea but it is happening slowly. At the end of Day 2, we finally tracked down the waiter, got the bill and learned the second lesson in tipping en franchise. It is: THEY DON'T TIP unless the service was above and beyond. I guess we now know why the bartender practically jumped for joy, spouting "merci beaucoup" after your naive Ramblers left a 1 euro tip on a pair of 5 euro Coca-Colas. Well, time for bed. Tomorrow is our tour with locals to several chateaus, a couple of wineries and a local French restaurant. Until then, au revoir and keep rambling.